As fall foliage season draws near, you may want to plan a visit to some of Vermont’s most beloved landmarks: our famous covered bridges. Other states have covered bridges too, but we have greater density and greater variety than anywhere else, and every one is a treasure. Not only do they have a range of structural trusses to interest the craftsmen, but there are often good swimming holes and fishing spots underneath. 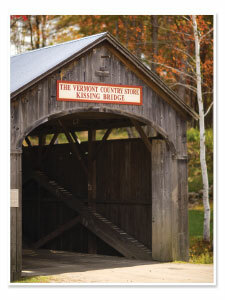 We have a covered bridge next to our store in Rockingham known as “The Kissing Bridge,” and visitors often ask why. It’s an old tradition from the horse-and-buggy days, when a boy would stop halfway across a covered bridge where it was quiet to give his girl a kiss. Old-timers used to call all covered bridges “kissing bridges” and somehow the name stuck to ours. We can assure you that there’s still plenty of kissing going on under the roof of our bridge. 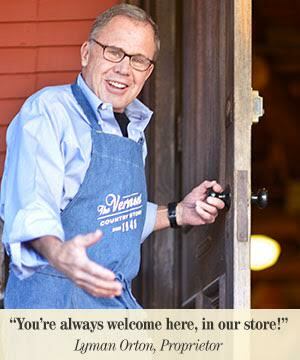 If you are in the area, we hope you’ll do your part to keep this tradition going strong. This is not relevant to the article about your “Kissing Bridge” but I just wanted to let you know I really love your catalog and the wonderful products from yester-year that you offer, all in all it’s a great idea, but your prices are so high on most items they are simply out of range for my budget. I’d love to try your orange cake for instance, and I don’t doubt that it would be fresh and delicious, it would be great for a family get together…but $60.00…WOW! I don’t know that this comment will have any effect on your company as a whole, but I just wanted to let you know.